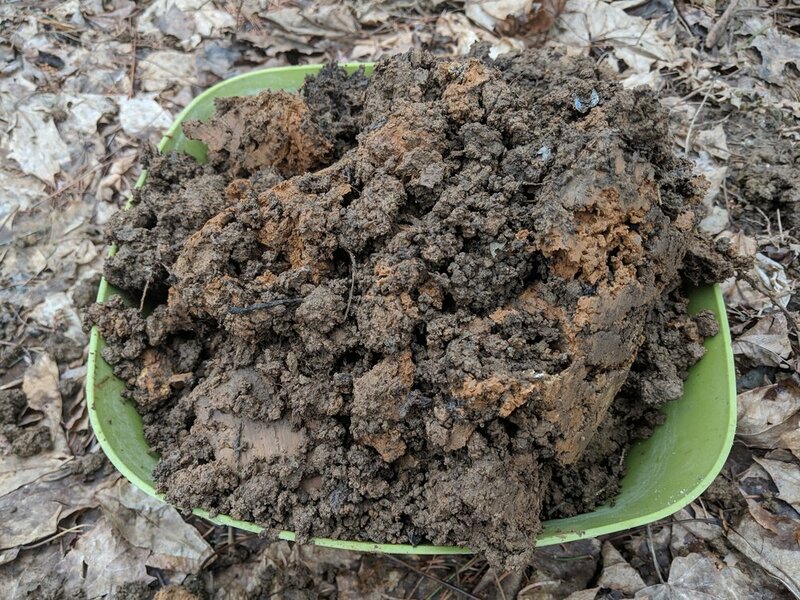 Clay is not hard to find, particularly if you don’t mind that it is intermingled with everything else (soil, silt, leaves, insects) you might expect in a backyard. 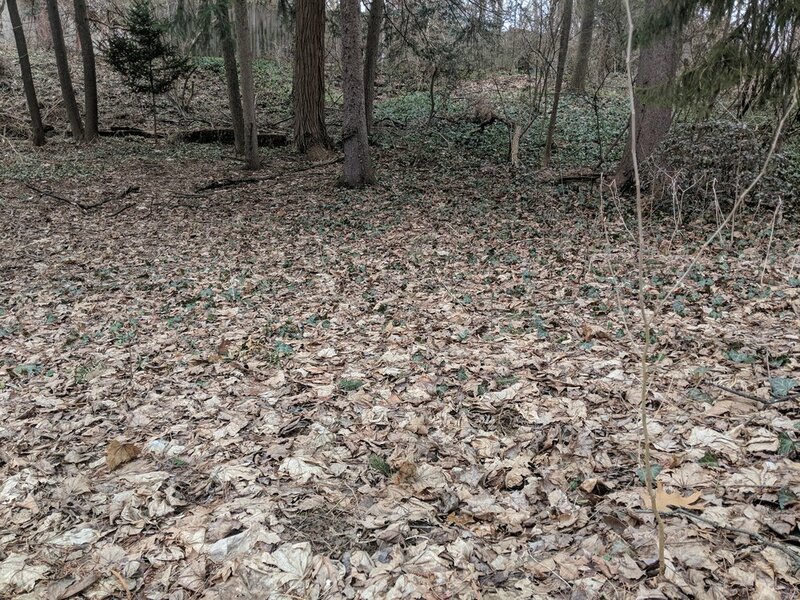 Just beneath the leaves pictured in this backyard is a thin layer of topsoil which gives way quickly to a dark brown/orange soil and clay mixture tangled up with tree roots rocks and insects. Clay extracted from a few inches beneath the backyard surface. This is no pristine core sample, its a mix of materials, but it will do. Separating the clay in this aggregate from the bulkier bits of debris is not hard to do but it does take some patience. First the whole mass is put in a larger container (in this case a 5 gallon bucket) to which a lot of water is added. Then the mixture of clay and water is mixed using a hand drill with a mixer attachment. clay plus water being mixed with a drill. A lid with a slot cut in it helps keep things clean. 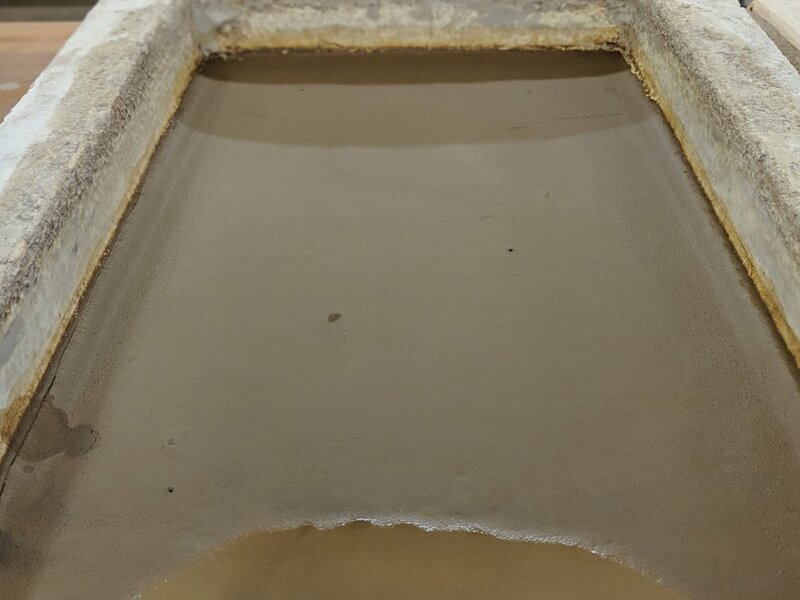 The ratio of water to clay is not terribly important, the idea is to just keep adding water until the mixture behaves like a thick fluid, which is much easier to work with than a dense clay. The mixing does not need to be particularly thorough, and as the clay has not yet been sifted one might find all kinds of things clinging to the mixer. Our clay had swimming stowaways in it. Sticks and stones, leaves, and bugs are all part of this mix prior to screening. 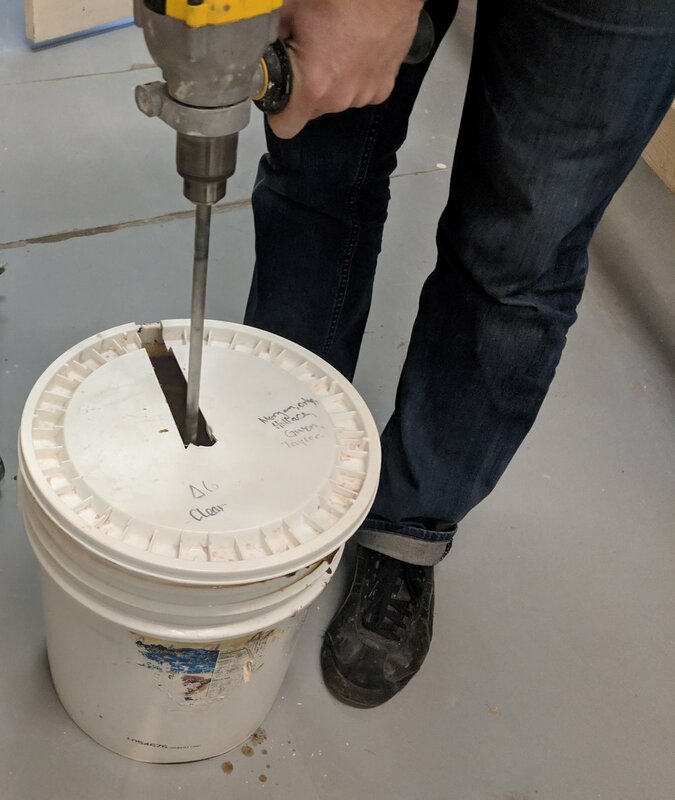 After some mixing the sifting process can begin by bringing in a second (clean) 5 gallon bucket and a wire mesh strainer with relatively large openings., like you might find in a kitchen - though it is probably best not to mingle tools that touch food with this process. The clay and water mixture can be poured through the strainer into the second bucket. 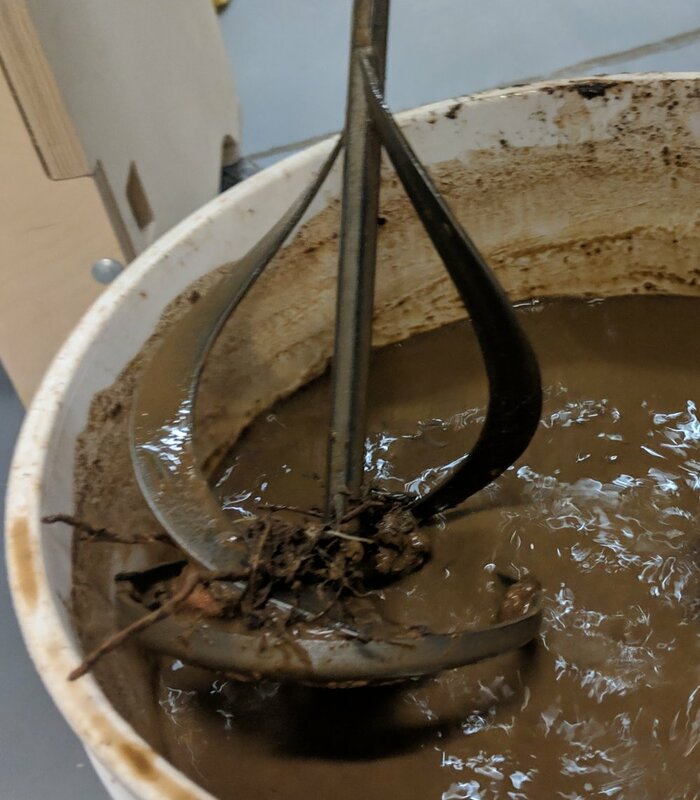 Once all the liquid clay has been poured from the first bucket into the second, the first bucket can be rinsed out (a workshop sink or outdoor hose is recommended for this fairly messy process). The mixture can then be screened again a few more times to get any remaining large debris out. The resulting clay mixture could probably be dried out and used as is, if one didn’t mind a lot of little bits of organic material being in the clay body. To sift the mixture further however, will require a finer mesh screen, such as this 40 mesh lab sieve designed to fit on a 5 gallon bucket. A 40 mesh lab sieve. 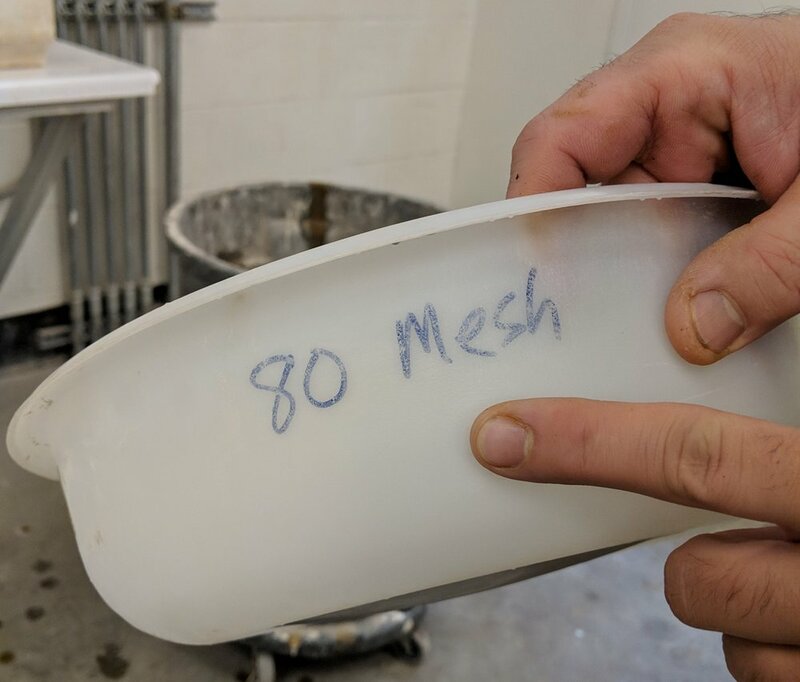 The process for sifting continues, but as the mesh screen gets finer it becomes easier to clog with clay, so it will be necessary to push some of the material through the screen with a sponge or a spatula. pouring through the 40 mesh screen. The process can get a little tedious at this point, as pouring the mixture through the sieve will continue to filter out material well past the first pour. So depending on how fine a material one is trying to achieve, several passes may be necessary. It is difficult at this size to identify the material being sifted out, any guesses? A 40 mesh screen is a grid of little wires woven into a tight mesh in which the openings are 0.42mm wide. So this would be a pretty fine-grained clay suitable for many applications after this sieving. One could go further too, using finer and finer sieves to leave behind only the tiniest particles. In this example an 80 mesh sieve was used next. An 80 mesh sieve was used next, slowing the process down quite a lot. It may have been overkill to use the 80 mesh screen - it clogs quickly so one has to spend a lot of time with a sponge or spatula pushing the clay through the mesh. The opening size in an 80 mesh screen is a tiny 0.177mm. The effort needed to use the 80 mesh screen made the prospect of using a 100 or higher mesh screen unappealing for this project. Having now created a large bucket full of very fine, very wet clay it is time to dry it out into something usable. 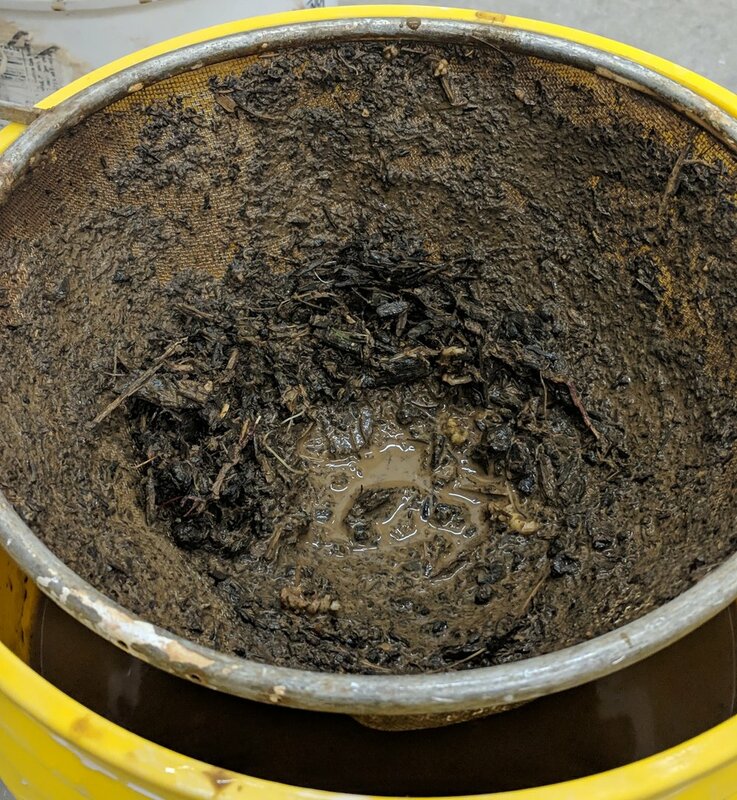 One way to begin this process would be to let the bucket sit and settle overnight and pour off the clear water at the top, keeping the clay particles which have settled below. In this example, such patience was in short supply. A pair of plaster troughs were used to pour the wet clay into. From this point on its a waiting game, as the dry plaster trough absorbs the moisture from the very wet clay. How long this takes will depend on many factors including the type of clay and the ambient temperature and humidity. But before too long the clay will dry out, and it can be beautiful in its own way as the shiny liquid surface turns to a velvety matte texture. Once the clay is in this not glossy yet still very damp state, one can begin to gather it up . . .
. . . or at least have fun playing with it. After gathering the clay up, it can be used for sculpting, wheel throwing, 3D printing, or whatever other application one might have. In this example, a first step was to make a small test tile which also served as a shrinkage test. 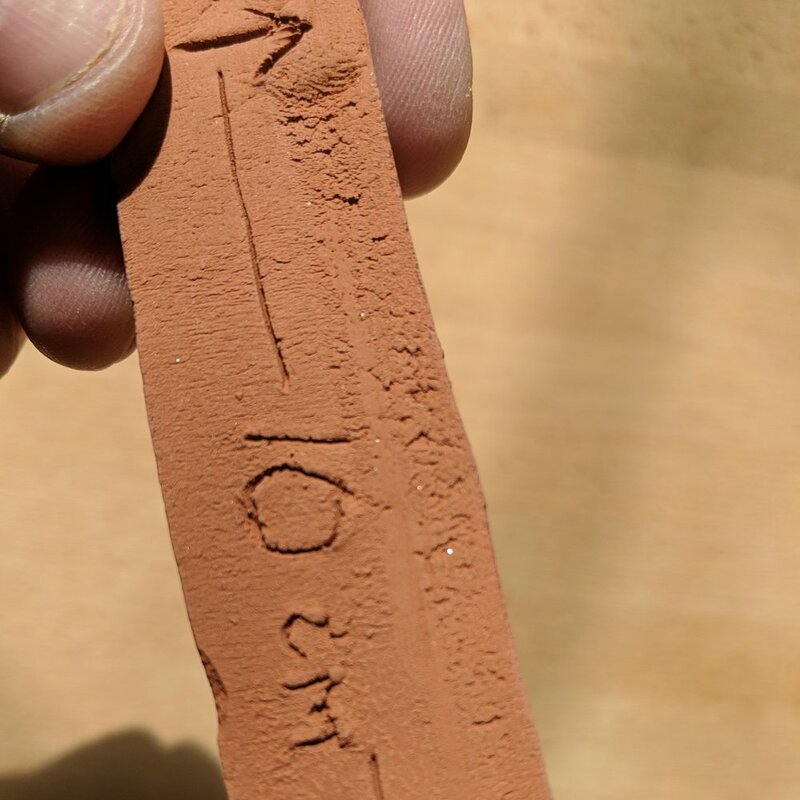 This test tile has a 10cm measurement inscribed on it which will serve to test both the drying shrinkage (the amount the clay shrinks as it goes from wet to totally bone dry) and the fired shrinkage (the amount the clay shrinks in the process of firing in a ceramic kiln. In this example the drying shrinkage was relatively high, at 8% (the 10cm measurement had shrunk to 9.2 cm when bone dry). Testing drying shrinkage on the unfired dry clay test tile. Drying shrinkage has a lot to do with the water content in the clay however, and this test tile was made from very wet clay, so using a drier sample would reduce the drying shrinkage (as there would be less drying to do). In this example the clay test tile was then fired in a kiln to 1940°f (1060°c) also known as “cone 04”. The resulting fired sample has a smooth texture, a strong burnt orange-brown color and even the occasional glittery bit of mica found in its surface. And that’s the process from the backyard to a test, with hopefully further experiments and artworks to come, taking advantage of the particular attributes of this local material. *Thanks to Marcella Lauerman for assistance with photos, videos, and process.